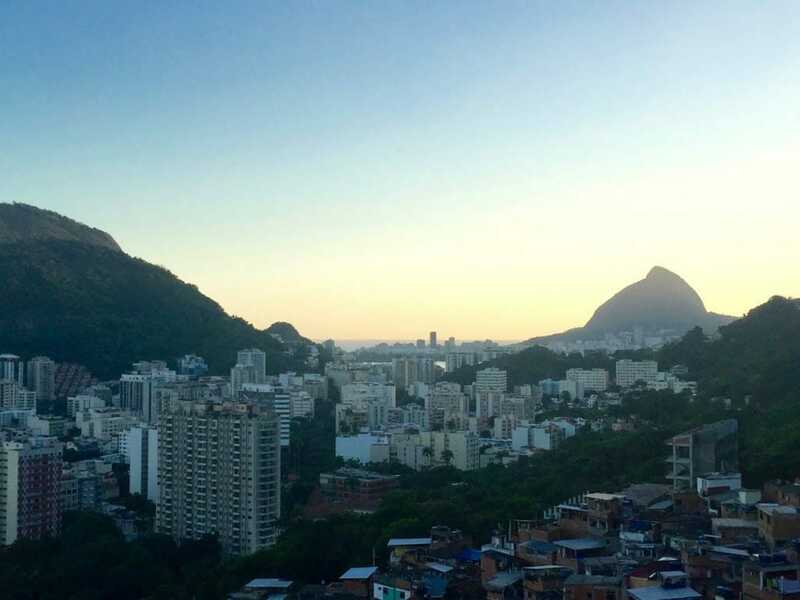 Visiting Rio once again, I was determined to explore the city and wander in areas that I have never seen before. What I could never imagine when I was younger, is that one day I would take a favela tour. 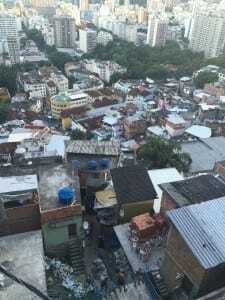 As a Brazilian I grew up hearing many terrible things about favelas, especially on the news but also in the movies. City of God and Elite Squad dug inside the favelas’ hard life and contributed even more to its bad reputation. I was terrified of just hearing the word FAVELA. Nowadays the reality is completely different. 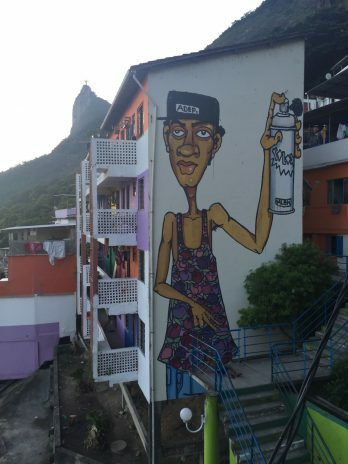 Favela has become so trendy, that even celebrities are buying houses there. People are hanging out on its hills and visiting bars to enjoy stunning vistas, and tours have become popular among locals and tourists alike. Everyone now wants to do a favela tour, and even President Barack Obama visited City of God favela during his last time in Rio. 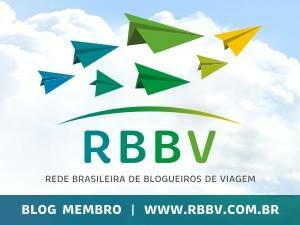 ∗ I was invited by Brasil Rio Tour to take a favela tour, and all the opinions here are on my own and unbiased. A favela is a slum within urban areas in Brazil; the first one appeared in the late 1800s after soldiers without a place to live settled on a hill in the city of Rio. The favela increased its population after the end of slavery and the people’s migration from rural areas to the city. Those new migrants didn’t have money to afford homes in settled urban areas, and so, as a result the favela grew extensively. Even in the 1920s the favela was already considered a social problem. During the 1950s, urbanization and expansion in Brazil provoked mass migrations to many cities, especially to Rio, Brazil’s capital at this time. But those hoping to take advantage of the economic boom didn’t find opportunities in Rio, especially with the change of the capital to Brasilia and many ended up in the favelas. 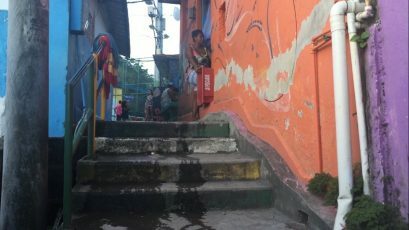 The poor infrastructure in the favelas is due to the lack of planning but also due to the government’s neglect of the areas. 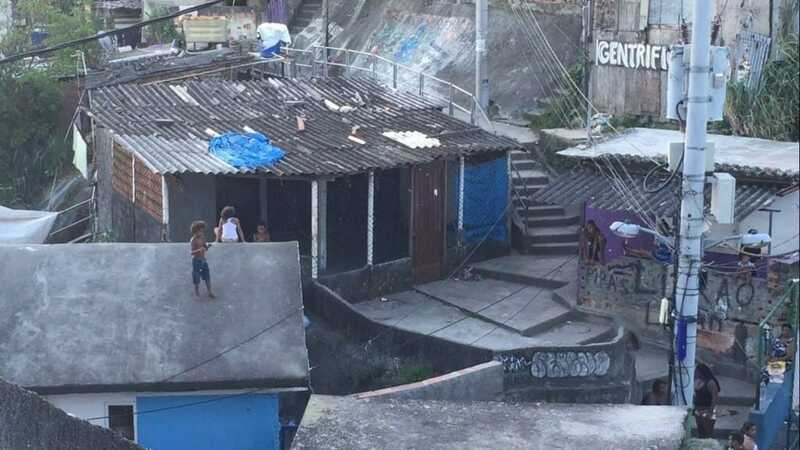 By the 1980s the favelas had become a place full of shantytowns with gangs fighting for control over turf with drugs and weapons dealers, and of course, violence. 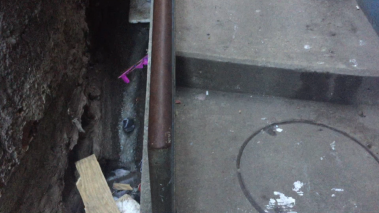 There was neither police nor any kind of government presence in the favela. 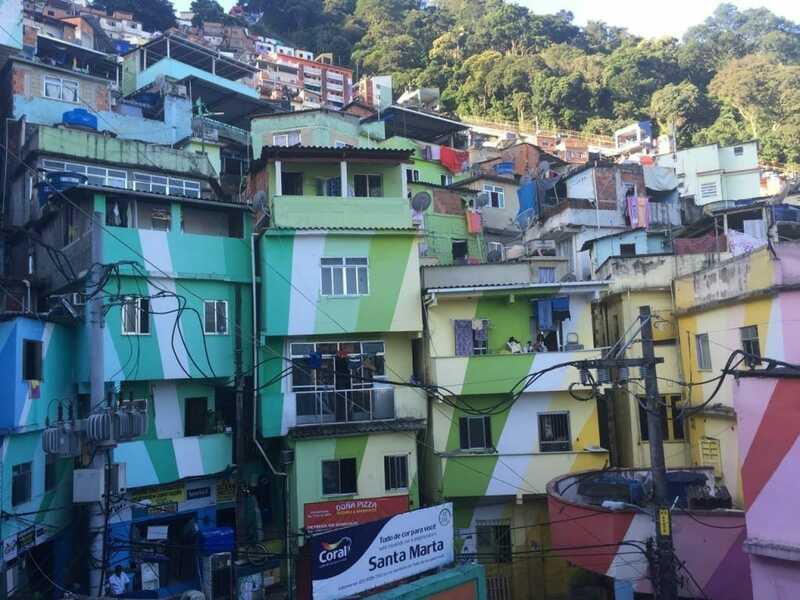 No one wanted to live in a favela, and sadly thousands of people lost their lives due to over crowding, unsanitary conditions, pollution, disease, and especially crime. 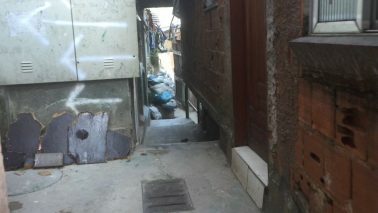 Since 1995 however, the government has been investing in and promoting the development of the favelas. 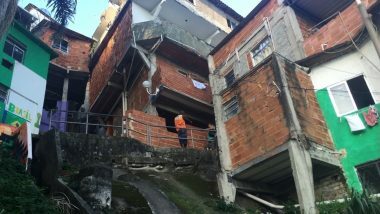 The turning point was the implementation of Pacific Police Units (UPP) that cleaned up the crime in the favelas and so since 2008 the favelas have finally been considered a safe place to live and to visit. 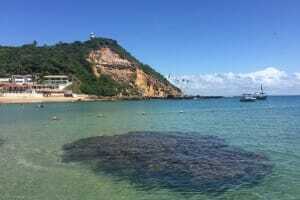 I decided to take a favela tour of one of the most famous favelas in Rio: Santa Marta. It became famous after Michael Jackson shot a video clip there (They don’t care about us) in 1996. Even if you have never been to Rio, you might have seen a picture of Santa Marta’s main square with its colorful houses. I met my tour guide, Jean René, a guy from Congo who has been living in Santa Marta for over three years, in the favela’s entrance. The entrance is full of stores and restaurants, with many cars and motorbikes parked on the streets. The first thing I wanted to see on this favela tour was exactly those bright houses which were located very close to the main entrance. Jean told me that a Dutch company created a project called Favela painting, and since 2010 Santa Marta has been covered with vivid colors. Santa Marta has over 6000 inhabitants living in around 1600 houses. 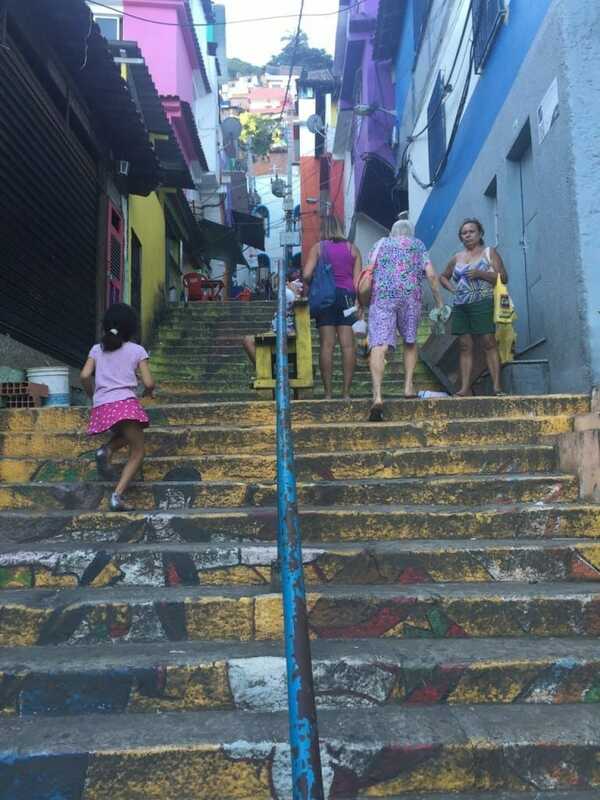 Most of the people climb the 782 steps to get to their houses even though there is a tram working on the favela. Despite the tram, I decided to climb all the steps and walk through the streets and alleys just like a local. 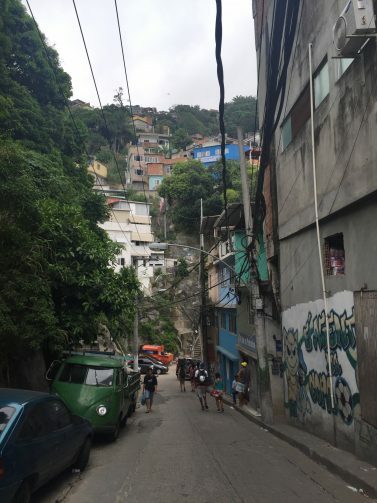 As we started our way to the top of the hill, I discovered that the favela was as vibrant as the colors of the houses, with many children playing on the streets and people going up and down. As we climbed, Santa Marta started to show its downside: very poor infrastructure with many unfinished houses one on top of the other, many tangled electrical wires, and very dirty streets full of dog poop. It felt like I was in a labyrinth and if it were not for my guide I would have gotten lost easily. 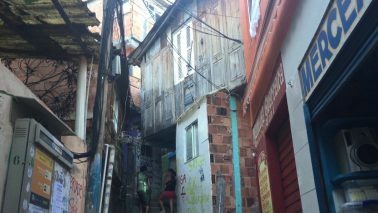 However, I was also enjoying this experience and I was glad for the opportunity to take a closer look at the favela and especially for demystifying old concepts. 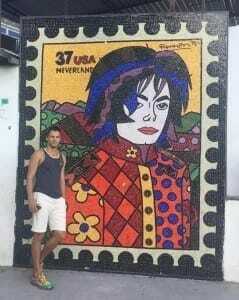 After around 20min we arrived at the most famous spot in Santa Marta: the slab of Michael Jackson. 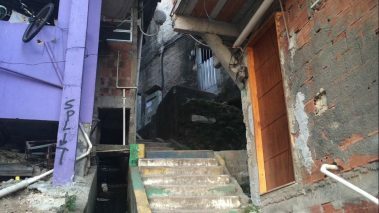 The set location couldn’t be more ideal for his political song “They don’t care about us.” His presence there was a huge turning point for the favela and the video clip called the world’s attention to one of the biggest problems in Brazil. 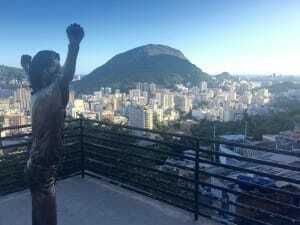 The slab today is the most photographed spot in Santa Marta, and is a square that has events constantly (samba and feijoada every first Saturday of the month), along with a mosaic portrait of the King of Pop made by Romero Brito, and a bronze statue as well. From the slab the view is just spectacular! I spent some time standing at the top analyzing the enormous contrast between the very simple houses of the favela with their blue water tanks on the roofs, and the modern high-rise buildings just a few meters away… Rio is a city of contrasts; one is the economic inequality! 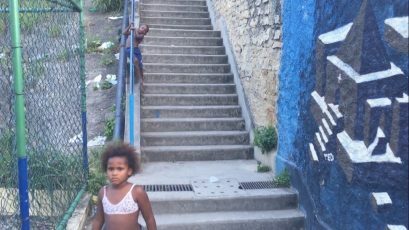 As we continued to climb the steps, I started to realize the bright side of living in a favela: life seemed so laid-back and everyone knows and talks to each other, that is not very common in big cities. After around 45min we arrived at the top of the favela. We could see more children playing, this time on the roofs of the houses with their kites, others were playing soccer at a football court, while the adults were talking to each other through the windows or seated on the ground. Life in the favela seemed to move at a slow pace and looked to be a worry free environment even though I am sure the people have daily struggles like everyone else. I made my way back down to the bottom and passed the alleys and streets once again, I talked to some people, stopped at a restaurant to get some açai and observed the local life. The favela tour not only broke paradigms and stereotypes that I had, but also unveiled a united community where its inhabitants are proud of their roots and proud of where they live. ∗ I highly recommend to take a favela tour with a guide. Not because the favela is not safe, but just because he/she knows the way and specially the people over there. ∗ From Copacabana to Santa Marta: local bus number 435 and 154. Wow! What an informative and intriguing post! I never had favelas on my radar. In fact I didn’t know they did yours, but now I want to take one! Wow. I’m so happy to read a different point of view regarding the favelas. Unfortunately, the movie City of God is still quite stuck in my mind. 🙂 I’m glad things are changing for the good! Yes, things are definitely changing for the good 🙂 Can we imagine for us Brazilian who grew up hearing so many things about the favelas? A big change tho. As soon as I saw the opening photo I knew exactly where you were. Great story! 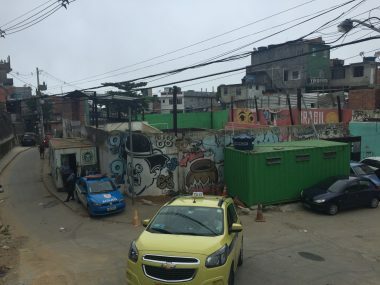 I visited the Rochina favela in Rio and it was absolutely incredible. We too did it with a tour guide and I agree with you about it not necessarily being for safety. There is no way I would have found my way out of there without him. 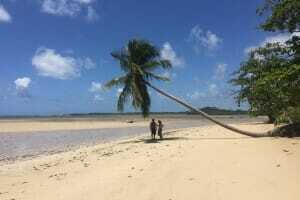 It also allowed us to get closer to the locals. We ate lunch there and even went inside our tour guide’s home whilst he played “DJ” for us and a couple of local kids. An amazing experience. Gorgeous photos too. You’ve done a fantastic job. Wow, this is an amazing post! 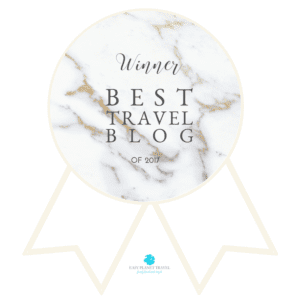 Thank you so much for including a brief history of the area and practical tips on how to get there. I have always been interested in taking one of these tours, but was always scared locals would perceive it in a negative way. It didn’t seem the case in your situation. Love all the colorful pictures as well.